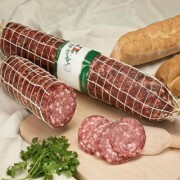 All our salami are available here to buy in the new 1/2 cut sizes to be sliced at home, each one is vacuum packed once cut for freshness and longlife. Made from coarsely chopped pork and seasoned with Paprika,this Chorizo is on the hot side. As this is the cured Chorizo it can be eaten directly,but also w..
Lovely moist Coppa Di Parma , seasoned in the traditonal farmhouse way , in a 1/2 size cut which is approximately 900g Perfect for home slicing&nbs.. Here we have the famous milanese salami made with finely minced pork,garlic and red wine in a half size cut The Milano is cured for up to four months a..
Our Napoli salami has a very gentle smoked flavour,with added black pepper corns and an intense aroma of beech and oak reminiscent of the area around Naples whe..
Smoked Pancetta is raw pork belly that is usually cut into lardons or cubes and added to pasta sauces to give a beautiful smoked salty flavour. It also works ve.. Originating from Lazio,Spianata Romana is made from quite finely minced pork,seasoned cubes of fat and garlic and a nice amount of paprika and chilli ..